It’s another Slimming World recipe, but it was utterly delicious. I made it purely to try something new, but I utterly loved it. As did my father, who has been badgering me to make it for him again. It says that you can serve this hot or cold; I can’t give you an accurate description of how it tasted cold because we polished off the whole thing before it had chance to cool down, but I can tell you that it’s bloody lovely hot. The recipe said to make four individual tarts, but I made one big one instead. Mainly because I didn’t have four individual flan tins. If you make it for four individuals, will you send me a photo please? I’d love to see if it’d work. I also didn’t use parmesan but good old grated low-fat cheddar. That worked fine. Maybe I’ll try it with parmesan if I’m feeling fancy one day. To make life easy for you, prepare all your ingredients first. Take all the fat off the bacon and cut it into slices. Then roughly chop the mushrooms, slice the garlic, beat the egg and halves the tomatoes. Then spray a large frying pan with Fry Light and heat it until hot. 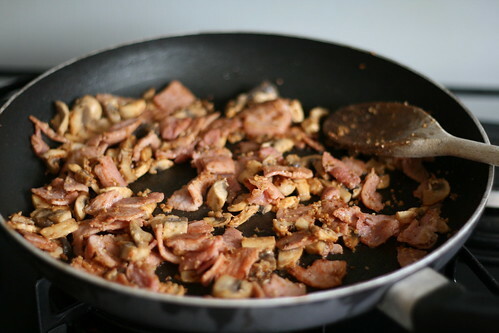 Fry the bacon for about 3 minutes, then add the mushrooms and garlic. Cook for about 4-5 minutes, add some pepper and set aside whilst you prepare the tin. Pre-heat the oven to 200C. If you’re using individual sheets of filo cut them into squares; if not, don’t bother. 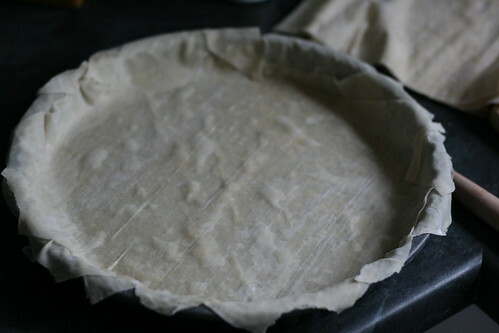 Simply line the flan tin with a sheet of filo pastry. 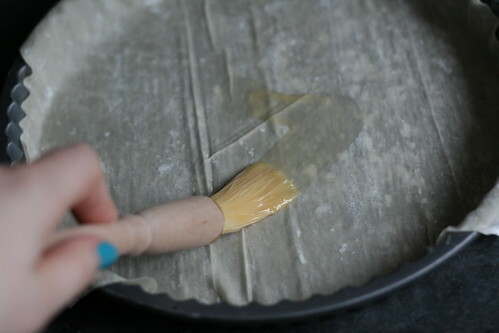 Then use a pastry brush to brush this sheet of filo with the beaten egg. Lay another piece on top, at a slightly different angle, and brush again. 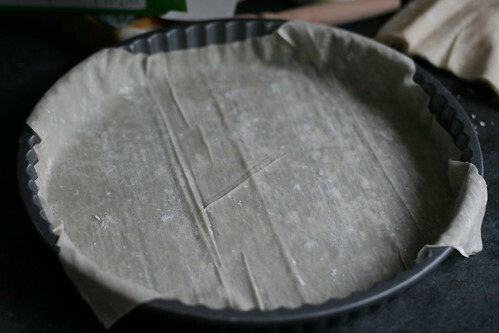 Repeat with the other sheets of filo until the whole tin is covered. 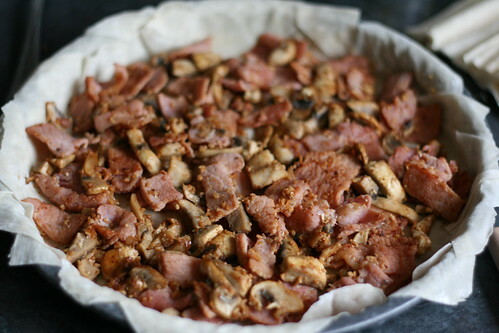 When you have your quiche base, tip in the bacon mixture. 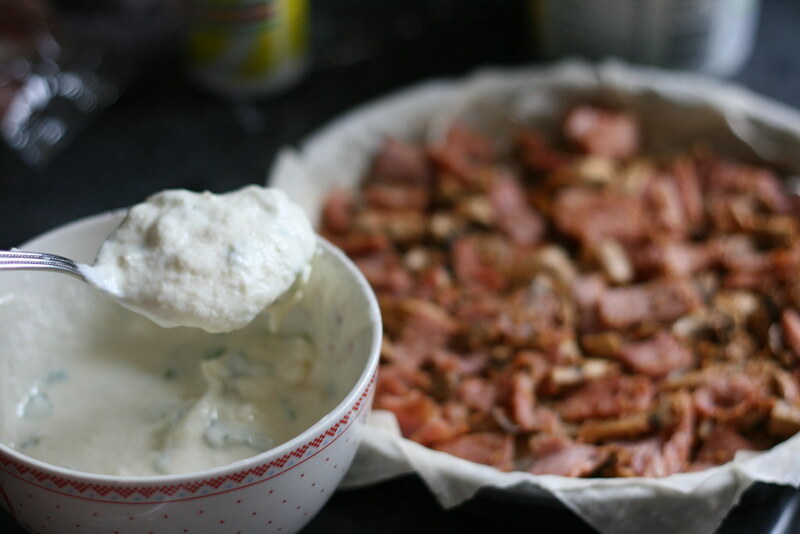 Mix together the rest of the egg with the Quark, fromage frais, parsley and grated cheese. 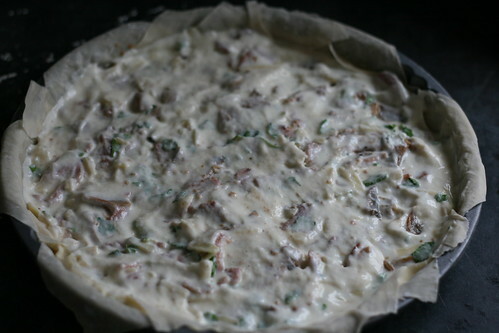 Then, spoon this over the bacon mixture. 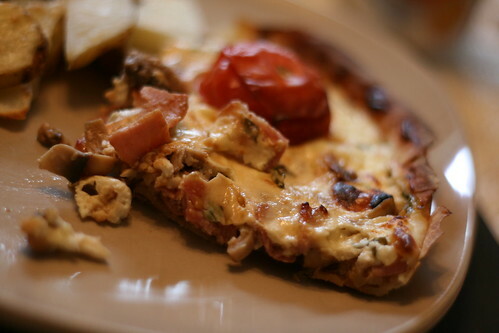 Smooth over the top, so your quiche looks a little like this. 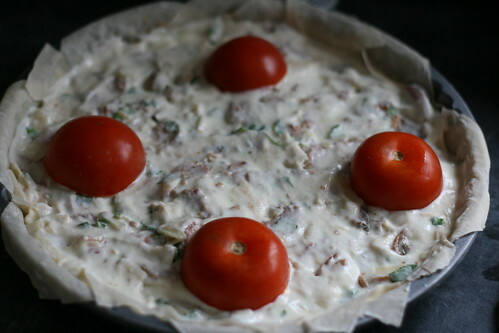 Then top with the tomato halves. It will look lovely and pretty, like this. I used big tomatoes (so Mum and I could pick them off) but you could use cherry tomatoes and dot it all over the top and it would look lovely. Cut into slices, and devour. I served mine with skinny chips and salad because it was a warm day, but I bet it would be gorgeous in winter with broccoli and cauliflower. I am also planning on making some more where I up the vegetables. Courgette, onion, pepper, chicken, yum. 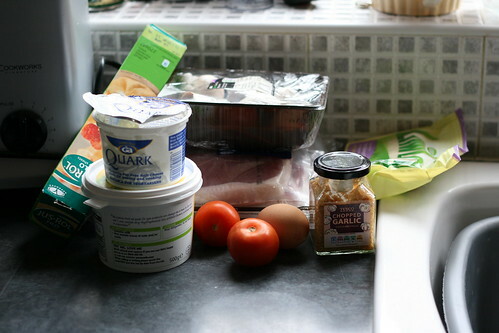 I bet you could make a whole range of scrummy quiches using this as the basic structure. Anyway, there’s a few more photos here. This is a great, easy recipe and a good way to use up leftover vegetables. I hope you love it. can you pls tell me for how many persons your recipe are for ,they look so filling . I usually do. With this one it really depends on how hungry you are. It’s the same width as a cake, so…4-8 portions, maybe? With veg? 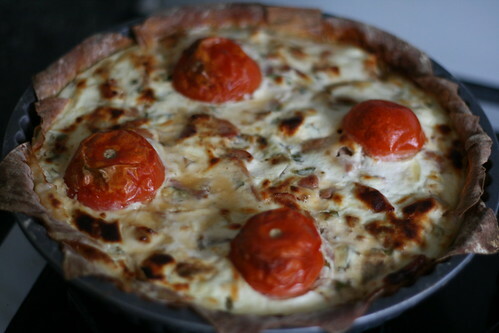 quiche looks gorgeous ; how many syns?